Meet our Vancouver in-house user experience designer Angela Dallin, who has over 10 years experience in designing websites that convert. In the following post, Angela will walk you through an 8 step UX design process that will help you create an exceptional website experience for your visitors. Who, what, when, why, where, and how someone uses a product. That product can be either physical or digital, and can include things like printed brochures, websites, or apps. User experience designers know how to understand users and craft a positive experience that suits their needs. 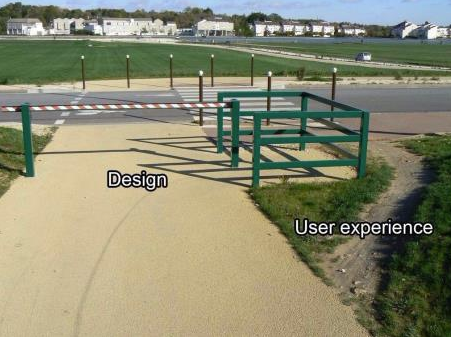 When a web designer has done their UX design due diligence, everything just works. The user can find the info they need, understand what they need to know, and have a pleasant experience with your product. UX design makes a good product awesome! It makes a product relevant for the user but also profitable for the business owner, because people will come back to use the product over and over again. UX design is a tangible, goal-directed process for ensuring a quality user experience. Just what is this tangible process, you ask? Well, every UX designer has their own specific method, but we’re going to let you in on the process used at our Vancouver agency when we design a new website. The very first step is finding out who your website’s target audience is, or should be. Among other questions, you need to ask: Who will be using it, when, why, and how.Find out things like: What would the user do in this case? How would they search for this? What would they expect to happen if they did this? The website look, feel, and language should appeal to and speak to its audience, because that’s who the website is for after all! 2. Determine your overall website goal and strategy. This is a crucial stage that lays the foundation for the success of your website. A website with no goal and no strategy isn’t going to get you the traffic and conversions you need. So start by getting your senior management team into a room, and then ask a lot of questions to determine your objectives, as well as how your offering should be communicated to your audience. Based on your research on your target audience, we always recommend creating two to three fictional characters, and then writing a narrative for each. These character stories should most commonly describe foreseeable interactions of user roles. Use this for reference in every subsequent stage of your website design and development to ensure you create the right experience. 4. Design the Information Architecture. Information Architecture (IA) is organizing a website’s functionality and content into a structure that people are able to navigate through intuitively. And it doesn’t happen by chance. Solid planning needs to happen at this stage to ensure the user experience does indeed turn out to be amazing. What is the point of creating great content if no one can ever find it? So your IA process should include site-mapping and wireframing, and figuring out the purpose of each page of the site. 5. Apply user interface design. You can’t just throw some good-looking graphics on a website and call it a day. A truly successful website is a product that’s both easy to use and presents a minimum amount of user interface friction. And of course, nowadays, this applies to phones, tablets, and any other devices just as much as desktop. So make sure the menu and the content not only look good, but are also easy and intuitive to navigate. Budget permitting, we always advise our clients to do a soft-launch of the website and test it with a sampling from your target demographic. This can help you gather data and feedback, so you can make any needed adjustments and create a truly top-notch user experience before the hard-launch. 7. Don’t forget to consult the data. After a website launch, we use Google Analytics to track data, such as how visitors arrived on the site, how they use the site, and how we can keep them coming back. For example, we can use GA to see how many people have viewed this exact blog, how long they’ve stayed on this page for, and if they go on to view other pages on our website. Google Analytics is amazing! Hard data is so important when it comes to identifying and tracking on-site user behaviour. So ensure you have an analytics program in place to track the success of your new website, and to find out if your users are really using it in the way you want them to. It’s imperative to think of a website as a living thing. It needs to be active, current, and fresh. So we always stress the importance of continuing to gather user feedback, so you can keep improving your site to maintain a positive experience for your users. At the end of the day, user experience design breaks down to “asking a lot of questions” during every phase of the design and development, as well as after the launch. Always questioning, always adapting means you get the best and most effective product. The result is a better website that works harder for you and helps improve your business’ bottom line. After all, we are talking user experience here. The better your users feel about their experience on your site, the better they feel about you - which keeps them coming back to you again and again. Have any questions? Ask away in the comments and we'll get back to you with some answers. Take your user experience knowledge up a notch with our free pdf guide below. Art Director Angela takes every project through a demanding creative process, beginning with research and analysis, continuing to brainstorming and conceptualization, before presenting her design solution. She is a highly creative and pragmatic team player. With a broad range of creative experience, Angela has the ability to see even the most difficult design challenge to completion.